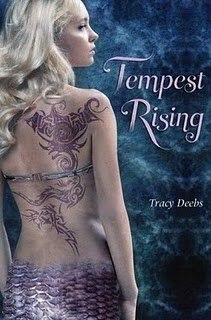 I love mermaids and I was excited to read Tempest Rising. I was really happy to find the plot to be well developed and exciting. This book had hints of Little Mermaid, but there is definitely a lot of darkness in Tempest Rising. I liked the prophecy about Tempest and found that even more intriguing. Tempest was a very strong character. I liked that she wasn't afraid to take risk. I also liked that she was conflicted about what to do, when the change came. She didn't want to be like her mother, but at the same time, she had to make her own decision. I liked that she cared about her family. Kai and Mark were both very different people that both cared about Tempest for different reasons. I liked that there wasn't so much as a love triangle as a transfer of feelings and I enjoyed that a lot more. The Sea Witch was frightening and exciting at the same time. Her obsession with her beliefs gave a vibe of Voldemort and Valentine of the Mortal Instruments series. The more minor characters could have been developed better. I found this book to be exciting and fun. I am really excited to see what Deebs will come up with next. The writing was gorgeous and I found the descriptive passages of under the sea to be memorizing and beautiful. I can't wait for more from Tracy Deebs. Overall, I found this debut to enchanting, exciting, and amazing, other then a few minor things I had with the pacing. I definitely recommend this book to fans of mermaids.